A keyboard is arguably the most important piece of input hardware on a PC. Ever tried conveying an important email or essay with a mouse? Of course you haven’t! For gamers, a keyboard goes beyond being a simple literary production device. We need something that is sturdy, comfortable, and has a reliable WASD setup (or QWER for in my case… obviously). Cue the COUGAR 700K, a solid keyboard that seems to hit all the right spots. COUGAR really know how to work sorcery when it comes to product design. Pulling the 700K out of its box yielded a keyboard that is, in my eyes, not only perfectly sized, but also beautiful to behold. In terms of build quality, the keys sit on an aluminium brushed structure. 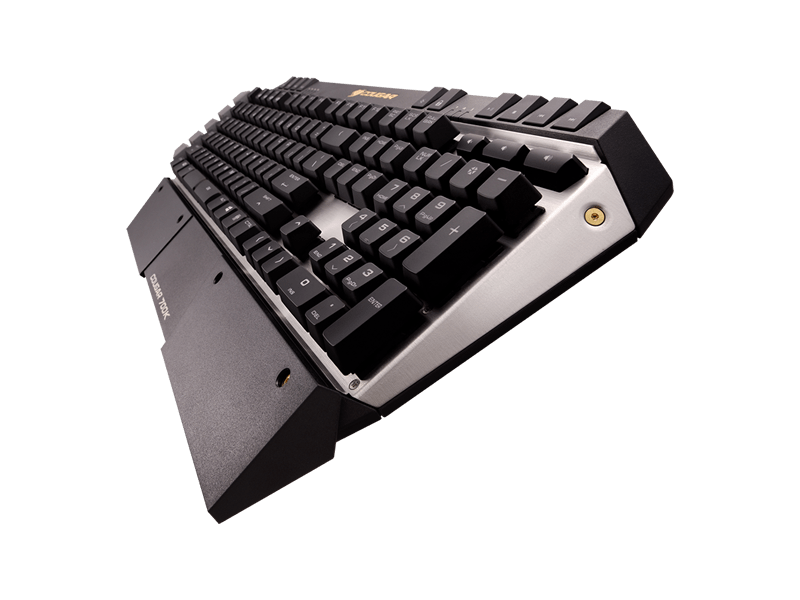 It looks neat, is durable, and serves as a solid foundation for those who like to give their keyboard a beating now and then. I don’t know if those gamers can bring themselves to lay a finger on the 700K though. It is simply gorgeous. Trust me, I’m not one for creative mumbo jumbo in terms of visuals, yet I can see why the 700K has received several design awards. Plugging it in lights up the keys with a nice bright orange reminiscent of a beautiful sunset in spring – or some other clichéd metaphor. However, If you’re looking for something that has over 9000 bazillion colours to customise with, you may want to look elsewhere. The 700K promises you the choice of any colour light you want for yours keys as long as it’s orange. This doesn’t bother me in the slightest. I think many keyboards these days are overdesigned and try too hard. As is to be expected from hardware of this nature, there are a whole lot of extra goodies over and above your typical keyboard. There are media keys, as well as a brightness and windows lock key. There are four for macro – one for recording on the fly, and another three for selecting different profiles. There are an additional six programmable G-keys too. Five sit along the left shoulder of the device, while the last one is placed strangely. The designers opted to slice the spacebar in half, allocating the right piece as an additional G-key. This will be a sore point for most people, I guarantee it. For me it wasn’t, as I use my left thumb to push spacebar 100% of the time. For those who make use of their right thumb, it’s not all doom and gloom thankfully. You can at least assign the G6 to register as spacebar key too. Lastly, there are audio inputs and an additional USB port built into the keyboard. This is something I think every single keyboard should come with stock standard as it makes PC life that little bit easier. 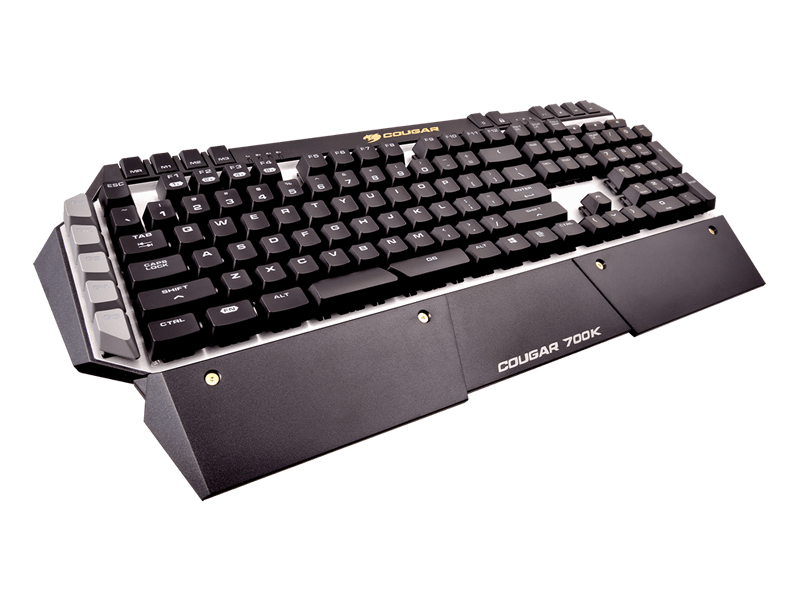 The COUGAR 700K is a mechanical keyboard, meaning you will sound exactly like a hacker when typing regardless of speed and accuracy. There’s something inexplicably awesome and hypnotic about that ticka-ticka-ticka noise when typing, and the 700K does not disappoint thanks to its Cherry MX mechanical keys. Apparently they have a 50 million operation life cycle, something I spent around 10 minutes trying to test before I gave up. My review unit was home to a Cherry MX Red set of keys. There is the option of black, brown, and blue too, I’m just unsure as to what the availability of those are locally. With regards to gaming though, red is ideal thanks to its low actuation force which allows for easier and more rapid key presses. If I blamed the 700K for my death or untimely demise in-game because the keys required an anvil to register, I’d be lying. They’re easy to press in, and should be comfortable no matter what kind of gamer you are. One of my biggest fears of changing to a new keyboard is that it will affect my typing accuracy, speed, and gaming capabilities negatively, at least until I adjust and adapt over the coming weeks. I do not make use of the typical typist style where each finger on both hands has access to a selection of keys. I tend to only use 4-6 fingers and a thumb in some sort of “freeform style” I have grown into over the past decade or so. Long story short, keyboards that are uncomfortable, have weird spacing between keys, or strange layouts, really do tend to stick out like a sore thumb for me. This was not the case with the 700K. In fact, I was well accustomed to it after only a hour or two of use. This really depends on you as the user though. I can say that from my side, I had no issues whatsoever. Typing and gaming on it was an absolute breeze. With regards to software, the COUGAR UIX System works well. You have control over everything from polling rate to repeat delay. I must admit, having the repeat delay on as short as possible is something I’m going to miss when I have to give the 700K back. I’ve never backspaced entire paragraphs of my bad writing so fast in my life! Users also have the option of 6-KEY or N-KEY rollover. N-KEY is perfect for when you need to have 4 people playing on the same keyboard at the same time and you need loads of keys to be registered without issue. There is also the option of having 1-8x repeat rate acceleration. Kiss those button mashing Hyper Olympic sessions goodbye! In all seriousness though, the keyboard does have those features if you do need them for whatever reason. The macro buttons work like a charm. You can choose to either set up your key combos of choice through the software, or even do it on the fly thanks to the macro recording key. This is nice for MMO or MOBA titles as you can adjust your macros according to the situation at hand. Seeing as I am a Dota 2 purist, I don’t believe in using keyboard tricks to get the job done better. Instead, I opted to turn my G1-5 keys all into Ctrl + Alt + Del combinations for when my PC acts up. As mentioned above, the G6 is oddly placed, so I set it as an extra spacebar. Doing all of this posed no problems whatsoever, and all keys worked as expected. One really annoying thing, and I feel this HAS to be mentioned, is the sleep mode the keyboard enters every two minutes by default. The keys flash on in the fashion of an equaliser. I was in awe the first time I saw this, as it genuinely is quite cool. It soon became incredibly irritating. Playing a game with my Xbox One controller or watching a video (essentially, whenever the keyboard wasn’t being used) meant this light show kept starting up. It is possible to disable this thankfully, it just took me way longer to figure out than I would’ve thought. The price may also be a sore point for some. R1799 is hardly a small figure to scoff at, and a figure that not every typical gamer may have hiding in their pockets. I’d be lying if I said I didn’t feel the 700K was worth every cent though. The build quality cannot be questioned, and its performance met all of my expectations. 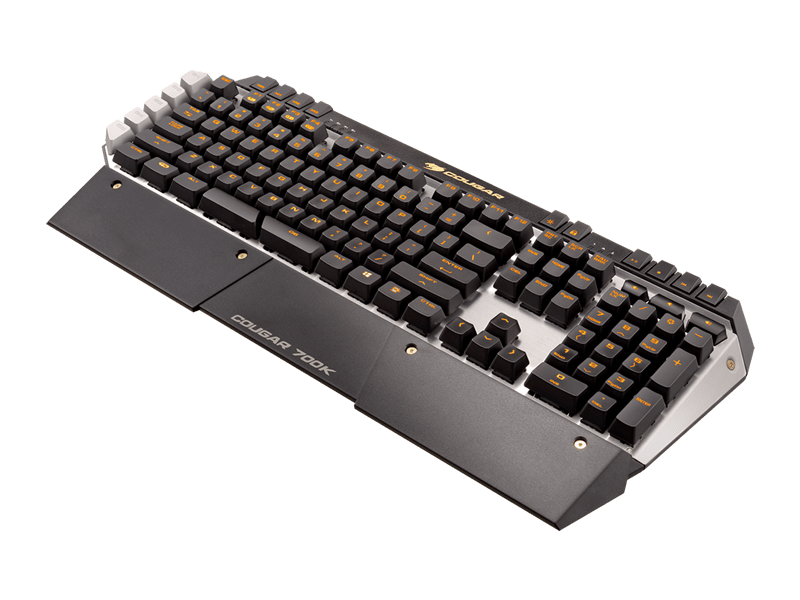 That being said, there are other gaming mechanical keyboards on the market that are similar in features and at a cheaper price. It will really come down to personal preference. From my side, I could easily recommend the 700K – if you can afford it. A keyboard that is excellent in both design and performance. 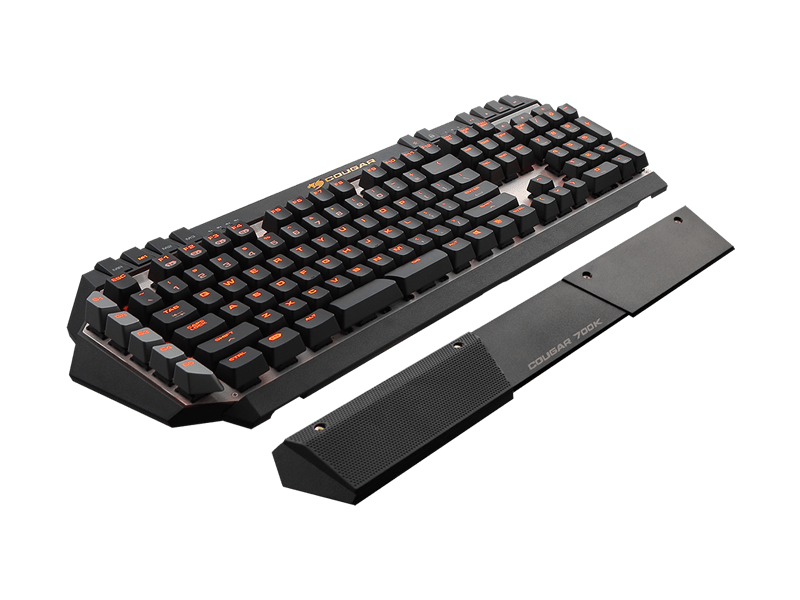 The price point is a tad steep, but the Cougar 700K is a keyboard with almost no flaws, and a device any gamer would be happy to own.